Here are some recent shots. 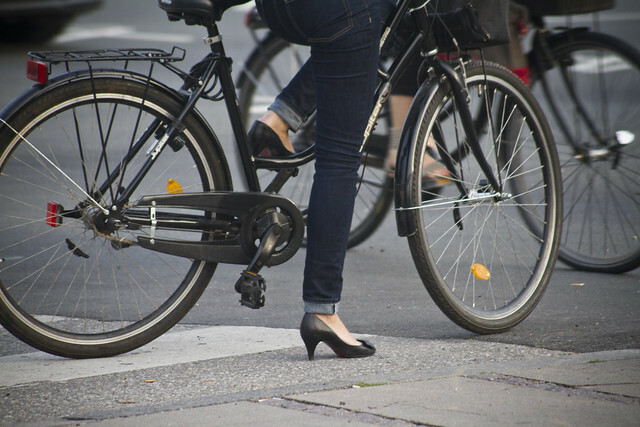 We realise that heels feature more prominently in European cities than elsewhere - indeed, two-thirds of Danish women say they wear high heels on a regular basis - but the impression you get from some internet discussions is that simple act of cycling in heels is like climbing Everest. Something that Danish women find amusing. They also can't believe that we *gasp* ride without helmets. Some people need to get out more. Not everyplace is like their neighborhood. I get comments on this all the time, living in a mid-size city in Canada. When people look shocked that I ride in heels, I just tell them the truth: it's easier to bike in heels than it is to walk in them. That usually gives them something to think about! But how do they clip on to the pedals? Jenny, biking in heels is still a fairly rare sight in my mid-size Canadian city (Ottawa) but ballet flats are very popular. Definitely agree with the harder to walk in than to bike in comments!